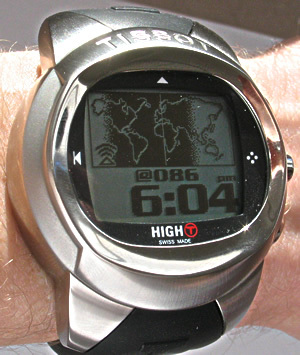 I just purchased a Tissot High-T watch. It is probably the most sophisticated watch I have ever seen and I have always been a watch fanatic. My wife is NOT a fan of digital watches and I was hoping this watch would be stylish enough to cross the line between “dress” watch and “geek” watch. I had never seen the watch in person and I ordered it online. Now that I open the package I realize it does not cross the line and is definitely more geek than chic. Regardless, expect to see me wearing it at trade shows and everywhere else. In addition I always carry a space battery for my laptop and noise canceling headphones. I recently purchased a laptop case with wheels. Now you know why. So although I am already up to my neck in chargers I decided to get another device that needs one. Thankfully the Tissot has a slim USB charger which shouldn’t take up too much space or weight. At some point soon – the masochist that I am, I expect to have an iPOD nano which means yet another charger. Tissot High-T. Photo taken by Watchreport. If you aren’t familiar, this watch has a touch screen which means you don’t need to press buttons to change some of the settings. I first noticed Tissot watches in Aruba about a year ago and I was fascinated by their ability to accept commands via screen input. The watch also has the ability to work with MSN Direct meaning it can accept data transmitted over a data network running on an FM radio frequency. I can get stock quotes, news, and sync with my Outlook calendar. What I am waiting for is two-way data capability so I can use this watch to carry on a wireless VoIP conversation. Now that is going to be amazing when it happens. The challenge here is figuring out how to power the watch so you can have normal conversations. As it is the watch needs charging every few days or so. Another concern Is heat dissipation as WiFi phones get very hot these days – imagine a WiFi watch! On a separate note, expect a huge announcement in the WiFi telephony area soon. Hint, we are reviewing an amazing WiFi phone that works on the world’s largest VoIP network and is made by one of the largest consumer electronics/tech companies. I can’t give you more than that but keep checking TMCnet for the latest on when this news hits. We should have the first product review on the market. Until then I am trying to figure out how to use the watch and get it all set up. I hope it isnt as much work as I fear to get it up and running.